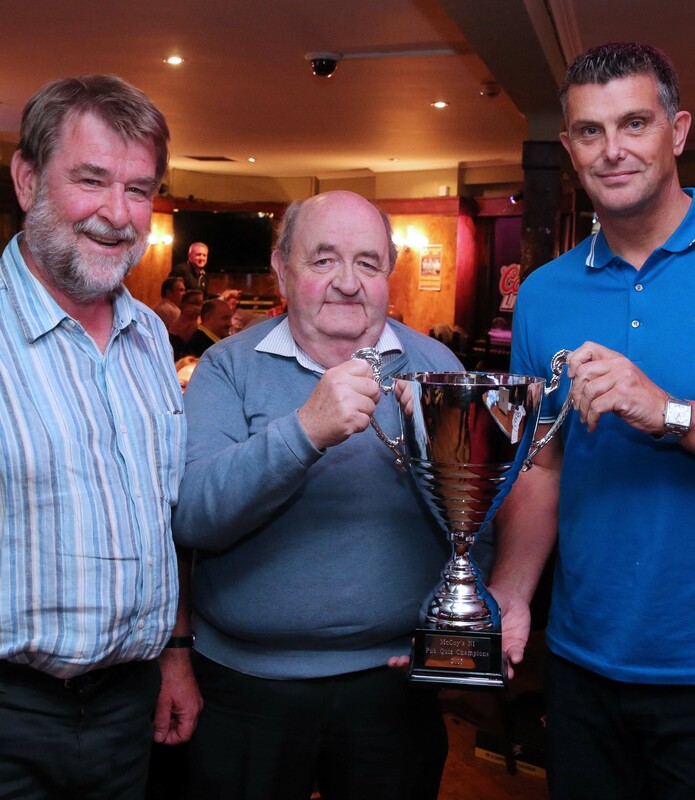 THE grand final of the annual McCoy’s NI Pub Quiz certainly had a sting in the tail when a team of friends buzzed their way to the coveted title of brainiest pub quiz team in Northern Ireland. 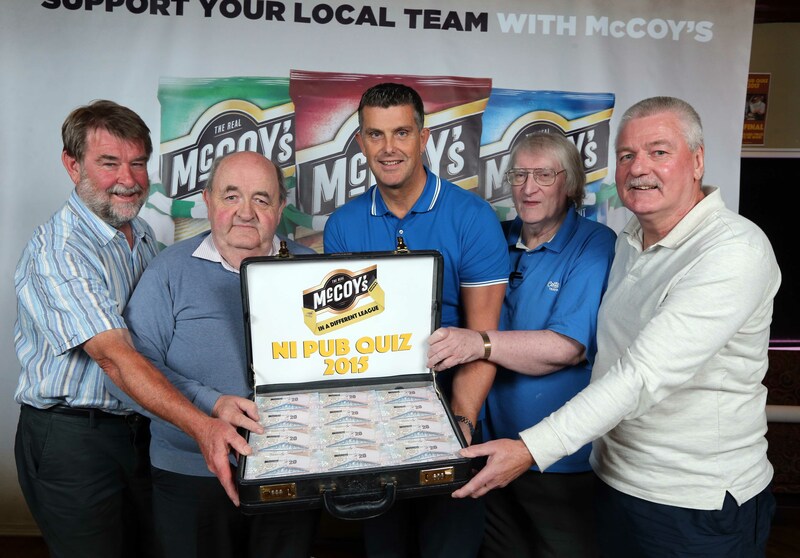 The Wasps Bee Team, representing The Windrose Bar in Carrickfergus, emerged victorious at the end of a three-month search by popular crisp brand McCoy’s to find the best pub quiz team in the province. Heats took place in 13 towns and cities across Northern Ireland with the winners of each heat converging at The Errigle Inn in Belfast where, after a hotly contested final hosted by U105 radio presenter Johnny Hero, it was The Wasps Bee Team who proved themselves to be ‘in a different league’ and picked up a tasty £1000 cash prize. The winning team comprised a group of four clever clogs, namely Norman Greer from Whiteabbey and Dominic Cassidy, George Cavanagh and Ricky Lyons from Belfast. Team captain Dominic Cassidy was delighted at his team’s success. “George, Ricky, Norman and I are absolutely over the moon to win the McCoy’s NI Pub Quiz 2015 after narrowly missing out on the title a few years ago,” said Dominic. “The four of us love a good pub quiz and regularly take part in local competitions. This year’s McCoy’s NI Pub Quiz was a great event that was exciting right to the very end, especially when we were crowned champions!! !” continued Dominic. Ricky Watts, McCoy’s Business Account Manager congratulated the winning team. 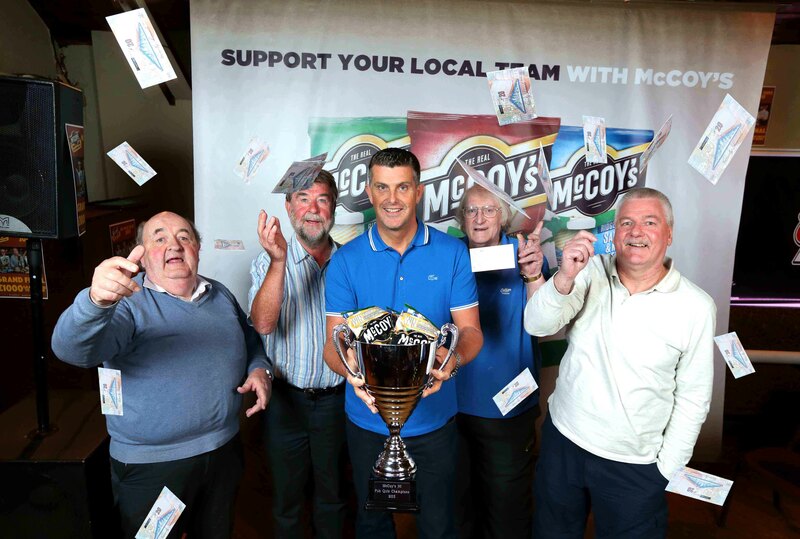 “The McCoy’s NI Pub Quiz is a much anticipated event every year with everyone competing valiantly for the £1000 prize and title of McCoy’s NI Pub Quiz Champions. Our finalists were certainly a bunch of intelligent individuals who made the final an exciting and nail-biting evening,” said Ricky. 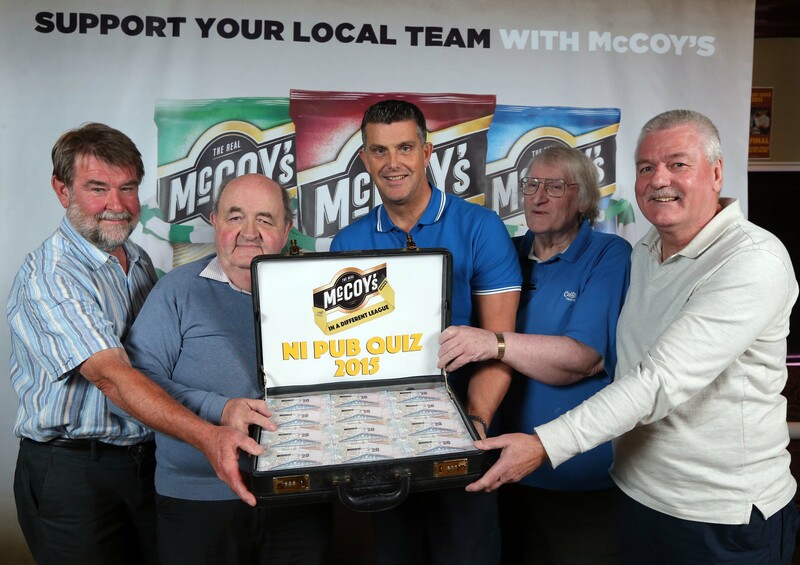 “This is the sixth McCoy’s NI Pub Quiz which gets bigger and better every year with almost 100 teams competing in our province-wide heats to fight for a chance to come to the fun and thrilling final,” added Ricky. 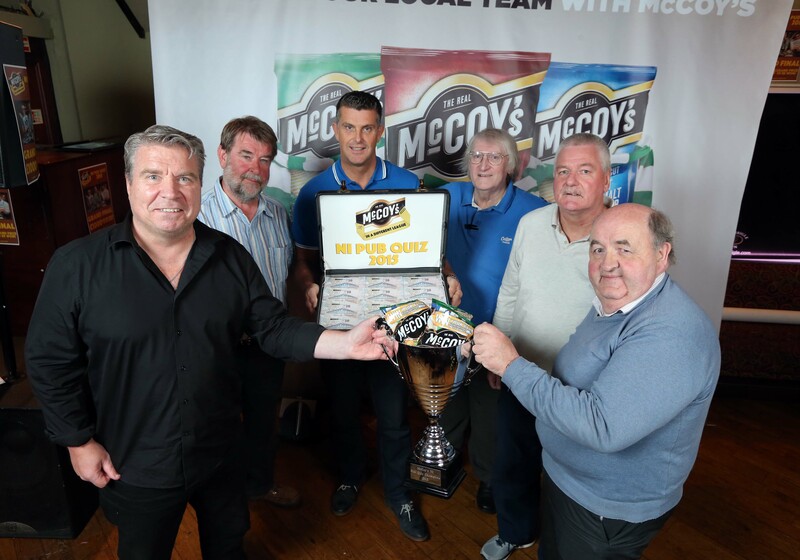 This year’s quiz was part of the larger McCoy’s ‘In a Different League’ campaign to mark the brand’s newfound status as the Official Crisp Partner of the Football League, the oldest league in world football which was founded in 1888. The popular ‘man crisp’ also secured a tasty deal to become the Official Crisp Partner of the Northern Ireland football team. In July this year, a deal with the Irish Football Association (IFA) will see KP Snacks provide a regular supply of McCoy’s Crisps to Michael O’Neill’s team who are currently in a strong position to qualify for the European Championships which take place in France next summer. As part of the partnership with the Football League, packs of McCoy’s will be giving away no fewer than 10,000 tickets for football fans to watch their favourite Football League team in action this season, as well as a chance for five lucky supporters to ‘win their club’ for a day. This unique promotion gives supporters a once-in-a-lifetime opportunity to shadow a club director for the day, learn how to run their club (including scouting and transfers), meet the manager and captain, visit the training ground, pick and train the team, choose the Man of the Match, run the Academy, deal with media and lots more – including £10,000 to invest in the club, towards the transfer of a new player. McCoy’s is the number one ridged crisp in Northern Ireland with 100% distribution across 350 symbol stores locally for its top three flavours Flame Grilled Steak, Salt and Malt Vinegar and Cheddar and Onion. Across the UK, McCoy’s crisps are consumed by more than a third of households and one pack is eaten every 15 seconds, with a total annual retail value of more than £107M. For more information on the McCoy’s NI Pub Quiz and to test your own knowledge on quiz questions follow @McCoys_NI on Facebook and Twitter. MEDIA ENQUIRIES: For further information, please contact Ciara Jordan or Bronagh Maguire of Duffy Rafferty Communications on 028 9073 0880.